Airstream trailers are enjoying an Instagram-era resurgence. 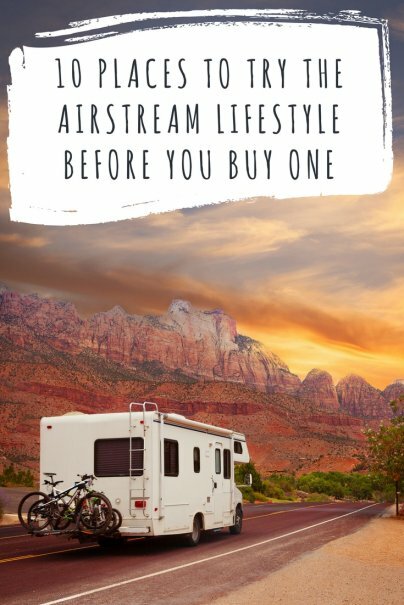 Their shiny, curvy exteriors and tiny-home interiors are just so dreamy that more and more of us are indulging in Airstream getaways. But the cold-as-aluminum reality is that a new Airstream trailer can cost upwards of $100,000, which is not an amount most of us would lay down without knowing for sure whether sleeping in a bunk beneath a riveted ceiling would make us claustrophobic or euphoric. Set in the ethereal Mojave High Desert outside Joshua Tree National Park, this motel features six vintage Airstream trailers decorated by artists in themes such as Hot Lava (you feel like you're inside a lava lamp) and Tiki. But the real draw is that the park is influenced by the wacky style of the owner, Kate Pierson, of the B-52s. Bang, bang on the door, baby! Cost: $175 to $200 per night. Operating since 1927, this resort along Highway 80 celebrates the retro kitsch of the Airstream lifestyle. Ten lovingly restored vintage trailers, including a 1955 Airstream, pair period decorations with modern comforts. Cost: $85 to $95 per night. Imagine that you're hanging in John Wayne's trailer on set of John Ford's The Searchers. Well, you won't have to stretch your imagination far if you stay in The Duke, just one of eight Hollywood-themed Airstreams at this glamping oasis in the wilderness. As if the trailers weren't enough of a Hollywood escape, after sunset you can watch a movie outside, sitting in a classic car just like a drive-in of yore. Cost: $129 to $149 a night. This wine country boutique hotel features two Airstream trailers with brightly colored bedding and sleek modern interiors. One trailer is a 22-foot Bambi model; the other is a limited-edition 28-footer with a full kitchen and luxe bathroom. All guests get pastries and coffee in the morning, and The Metro offers a cafe and bike rentals for pedaling into historic downtown Petaluma. Cost: $149 to $235 a night. Set on the Jersey Shore, this hotel has two doo-wop-inspired trailers for you to stay in swanky style, each with a double bed, a day bed, private bathroom, kitchenette, and lava lamp. You also have access to the hotel pool, and the beach and boardwalk are steps away. Cost: $81 to $211 a night. Sleep in a modern 26-foot Airstream equipped with a queen bed, a full bath with shower, and a Keurig coffee maker. This campground is on the same island as Acadia National Park. And a 10-minute drive gets you to the gorgeous coastline and freshwater lakes in the area. In the heart of the bohemian and artsy town of Ojai, Caravan Outpost consists of 11 "curated" Airstream trailers set in an urban garden. Outdoor movie nights and pop-up eateries add to the fun. Each trailer comes with complimentary bikes to explore the Ojai path. Cost: $147 to $309 a night. Set in the heart of the Temecula wine country, this Airbnb rental features a pool, an on-site vineyard, and 40 wineries within minutes. You can also watch hot air balloons float from the deck. Cost: $119 a night and up. Five hundred dollars might seem like a lot to sleep in a trailer, but how gorgeous is this Airstream perched on a bluff above a Malibu beach? Gorgeous enough that Vogue chose it as the backdrop for a photo shoot of bffs Taylor Swift and Karlie Kloss. And the entire ocean-facing side opens up for an endlessly gorgeous view. Cost: $500 per night and up. Cost: Starts at $2,300 for three days and tops out at $17,500 for two weeks during peak season. Prices include the SUV to tow.